New South Wales was a British Crown Colony founded in 1788 that comprised of Australian mainland, Van Diemen’s Land, Lord Howe Island, and Norfolk Island. In 1840, New Zealand also became part of New South Wales after the British annexed the area. The British colonies of Tasmania, South Australia, Victoria, and Queensland were established in the 19th century as they separated. 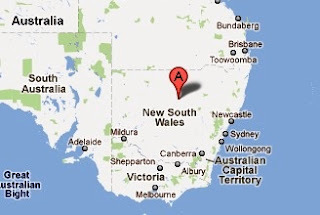 Currently, New South Wales is an area located in the south-east of Australia bordered by the states of Victoria to the North, Queensland to the South, and South Australia to the East. The state has a total land area of over 300,000 square miles and a population of over 7.2M, making it the most populous state in Australia. The first stamp of New South Wales was a Seal of the Colony 1p red issued on January 1, 1850. The stamp (Scott #1) is very rare and sought after cataloging in the $7.5K range for Mint and around $575 for Used. The original issue was on yellowish wove paper and that has several color varieties including brownish red, carmine, and crimson lake. They catalog in a similar range to the original issue. Varieties on bluish wove paper also exist and they catalog in a similar range as well. This issue was followed by another issue in a very similar design in August 1850. Those stamps are also very rare and valuable. A large number of color and plate varieties exist for the first seven issues. The Seal of the Colony theme was replaced by the Queen Victoria (QV) theme in 1851. The first issues were a set of two stamps in yellowish wove paper. The set (Scott #10, #11) catalogs for around $4000 Mint and around $500 Used. Different designs on the same QV theme continued through the period till 1888. Many of those issues (Scott #12 to #77) catalog well into the 100s with lower denominations generally commanding a progressively lower catalog value. New South Wales released a couple of stamps in 1903 – the first one (Scott #107) features Lyrebird and that catalogs for around $60 Mint and around half that for Used. Specimen overprint variety exists and that fetches a 40% premium over Mint. The other issue shows ‘Australia’ allegory. That stamp (Scott #108) is more common and catalogs for around $20 Mint and around one-fourth that for Used. Specimen variety exists for this one as well and that commands double the premium. A rare Peforation variety (Perf 11) exists as well and that catalogs for around $2K Mint and around $1K Used. New South Wales united with the rest of Australia to form the Commonwealth of Australia in 1901. Stamps of Australia replaced New South Wales stamps from that point on, although New South Wales stamp issues continued till 1907. The first coins of New South Wales were cut and counter-marked Silver Pence (KM# 1.1) released in 1813. The issue is very rare and valuable fetching in the $30K range for VF. A few other issues showing similar design and denominations up to 15 Pence were also released and they are very valuable as well with catalog values comparable to the first issue. A good specialization area for New South Wales is private token issues from the 19th century. There are a large number of these items for New South Wales as well as the other states. Many of them are valued well into the 100s. Original 19th century or prior maps, historically relevant 19th century photographs, souvenir spoons, etc are good collectible memorabilia of New South Wales.